A perfect combination of Yucca wood and Pine Wood make this an ideal combination for the wood chewing bird and a great starter for the bird that is learning to chew wood. The Yucca Wood Chew Chew contains (2) 2.5" size wood chews and one Yucca wood chew. 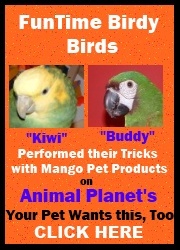 Ideal for Amazons, African Grey, Eclectus, Cockatoos, Macaws and all similar sized birds. Yucca Wood Chew Chew Bird Foot Toy5Diana S.September 18, 2016My CAG Chiyome has a 'toy drawer' in the kitchen. I try to keep a variety of toys in it for her to chew/shred/fling. The Chew Chew is a favorite for her because she gets the immediate satisfaction of destroying the yucca chew in the middle, and having the two wood blocks for longer-term chewing fun. Yucca Wood Chew Chew Bird Foot Toy5Barbara cJuly 24, 2014Puck LOVED it. Good thing I bought more than one. He played with it all day long. It is one of his favorites. Yucca Wood Chew Chew Bird Foot Toy5Gail Piper for HaleyMarch 1, 2014Haley loves the various pieces tied together which make for a great chew-it-up experience. They shred well which she loves! Yucca Wood Chew Chew Bird Foot Toy5FrankieOctober 31, 2013Well, it's not exactly a 'foot toy' if you're a budgie, but it's still really fun to climb on and chew. A very good workout for all beaks large and small! !